Blogs and Twitter feeds are an increasingly important means of communication for the HEP community. Whether it is the casual thoughts and observations of an individual or the official communications of an experimental collaboration, these modern avenues provide a nice background briefing to help us make sense of the official literature and keep up with the latest developments we may otherwise miss. Following suggestions from some of you, INSPIRE recognizes the importance of this and we’ve begun to add this information to our records. See HEPNames for a list of links to tweets and blogs from the community, EXPERIMENTS for the Twitter feeds of the collaborations and INSTITUTIONS to keep up with news from your favorite HEP labs. 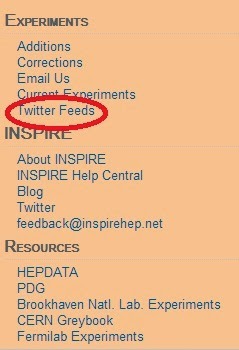 You’ll find these links on the Orange Boxes on the right hand side of INSPIRE. Do you know of any we’re missing? Contact us at feedback@inspirehep.net.